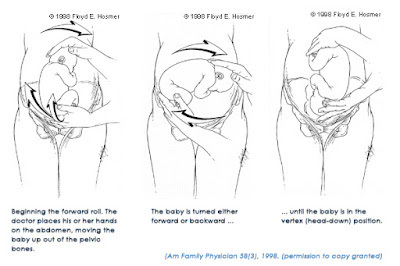 People whose babies are breech and have a history of a prior cesarean are often told that External Cephalic Version (ECV), manually encouraging the baby to turn head-down, is simply not a choice for them. The fear is that manipulation done during an ECV might make the uterus rupture along the scar from the prior cesarean. We have discussed ECV after a Prior Cesarean extensively before. The results of all the studies so far suggest that ECV after prior CS is not unduly risky and can avoid many unnecessary repeat cesareans. ECV should be offered to women at term with a breech presentation, regardless of prior cesarean status. Unfortunately, ECV is woefully underutilized. One study from New Zealand estimated that only 26% of eligible patients with breech presentations were referred for ECV. Recently, a new study (Impey 2018) was published that looks again at the question of ECV after prior cesarean (CS). Its results were both encouraging and disappointing. In this new U.K. study, researchers looked back retrospectively over a 16 year period and found 100 cases where babies of women with a prior cesarean presented breech at term, were offered, and consented to a ECV. Basically, the study found about a 50% rate of success in turning the baby head-down. Those who had head-down babies afterwards had a trial of labor after cesarean (TOLAC), and 68% had a VBAC. The authors did a literature search on ECV after prior CS and found no increased rate of uterine rupture after ECV. That agrees with the literature search we did. However, the authors chose to dilute this good news by pointing out that while ECV avoided some cesareans, only 30 women out of the 100 original group had a VBAC. In other words, while they found the practice safe, the way they word the abstract made it sound like instituting a practice of ECV after prior cesarean is not worth pursuing because it is only marginally successful. This flies in the face of previous research. The big question is why their ECV success rate was so low. Only 50% of their ECV tries worked to turn the baby head-down. That reduced their candidates for TOLAC by half, and then only about 2/3 of these women had a VBAC. That's why the final numbers were low. If you look at comparable studies, Weill 2016 had a 74% ECV success rate, while Burgos 2014 had a 67% ECV success rate. Why were their results so much better? That's what the UK study authors should be asking themselves. Seems like they need training on how to do ECV more successfully. The good news from the study is that External Cephalic Version after a prior cesarean is safe. There are potential risks inherent to the procedure, of course, but these risks do not appear to be any greater in women with prior cesarean than in those without a prior cesarean. And of course, the alternative of an automatic repeat cesarean with a breech carries its own potential risks that also must be considered. The choice should be up to the mother. The bad news from the study is how few women with prior cesareans are being offered ECV and how low the ECV success rate was. It took 16 years in the study to find a data pool of 100 women who had a prior cesarean and a breech presentation at term who were offered an external version and who accepted it. ECV is tremendously underused, especially in those with a prior cesarean. And a ECV success rate of only 50% is pitiful. Better training is obviously needed. External Cephalic Version at term can avoid many unnecessary cesareans, yet it is woefully underused in many institutions. It is a reasonable choice that needs to be expanded, especially in women with prior cesareans. Furthermore, training to achieve greater ECV success rates in more places needs to occur. OBJECTIVE: External cephalic version is commonly not performed in women with a previous cesarean section. Fear of uterine rupture and cesarean section in labor are prominent. The risks, however, of these are unclear. This study aims to document the safety and efficacy of external cephalic version in women with a prior cesarean section in a series of 100 consecutive attempts, and to perform a literature of the existing literature. STUDY DESIGN: This is a retrospective cohort study of prospectively collected data of external cephalic version attempts in women at term with a previous cesarean section, and a literature review of previously published series. External cephalic version was performed by one of 3 experienced operators, with salbutamol tocolysis if appropriate, using ultrasound to visualize the fetal heart and place of fetal parts. RESULTS: 100 women with a prior cesarean section underwent external cephalic version over a 16-year period in one institution. 68% had no previous vaginal delivery. The external cephalic version success rate was 50%, and 30 (63.8%) of these subsequently delivered vaginally. There were no cases of uterine rupture or other complications. A literature review of series containing a total of 549 cases revealed no cases of uterine rupture or perinatal death. CONCLUSIONS: External cephalic version in women with a prior cesarean section is safe but enables a vaginal birth in only about a third of women. Click here for older references on ECV after CS. This post is to remember and honor one of our Health At Every Size® heroes. 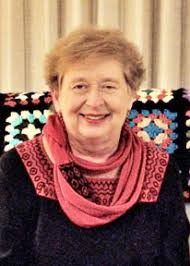 Joanne Pakel Ikeda died on November 27, 2018 at age 74. She was a faculty member of the Nutritional Sciences Department at the University of California, Berkeley, for nearly 35 years. She helped students gain knowledge and skills in nutrition education and counseling. Joanne was known for her role in the development of a new approach to weight management entitled Health at Every Size® (HAES). Mid-career she came to the conclusion that subjecting large people to food restriction, body dissatisfaction, and size discrimination was futile and only resulted in physical, psychological and social damage to these individuals. She and others determined that rather than focus on weight, the focus needed to be on health. Research showed that many large people could improve all aspects of health with lifestyle modifications unaccompanied by weight loss. The idea to focus on health instead of weight was a radical, transformative notion in the field of nutrition and medicine and turned the field on its ear. While it has gained a great deal of traction, HAES sadly remains radical to many in those fields, but she never backed down. She was especially determined to protect children from becoming casualties in the “war on obesity” by promoting a Health at Every Size approach for them instead. Here is one of the posters she lent her support to. Joanne fought hard for size acceptance for all ages and spoke at many conferences and other occasions about Health At Every Size. She worked with NAAFA (National Association for Fat Acceptance), which is where I met her. 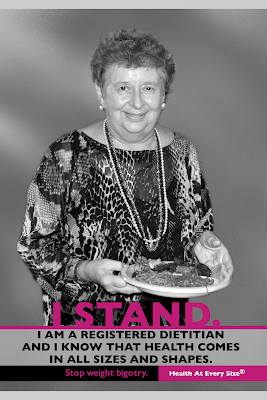 She helped establish ASDAH, the Association for Size Diversity and Health. She backed up her beliefs with action by testifying before the San Francisco Board of Supervisors about an ordinance banning size discrimination in employment, housing, adoptions, jury selection and other domains. That took guts. Joanne did not just specialize in weight-related issues. She also studied the nutritional habits of various ethnic groups, immigrants, and low-income people in California and developed culturally sensitive nutrition education materials. She was a visionary in her field in many ways. She accrued so many honors, I will only list a few here. 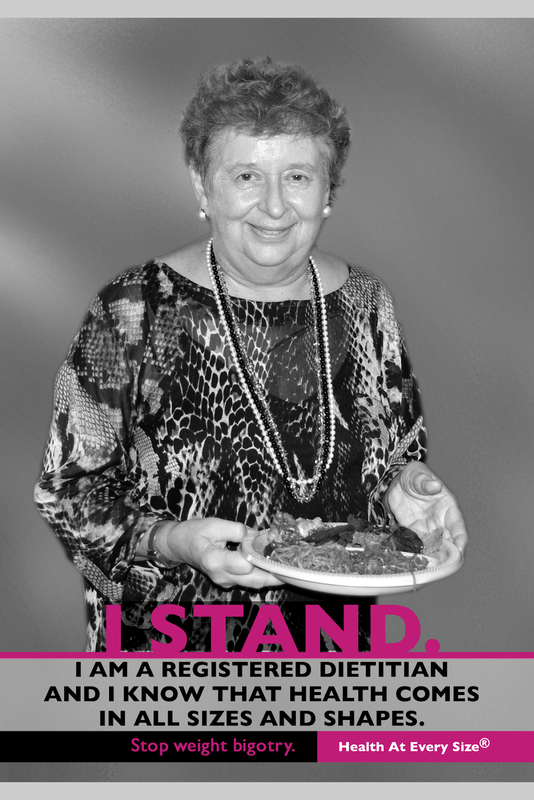 She served as President of the California Academy of Nutrition and Dietetics, then was elected President of the Society for Nutrition Education and Behavior. She was co-founder of the UC Berkeley Center for Weight and Health. In 2018 she received the Helen Denning Ullrich Award for Lifetime Excellence in Nutrition Education. I had the honor and pleasure of hearing Joanne speak in person and getting to chat with her afterwards. She was a warm, unassuming person, but she also knew her research and her points were evidence-based. She was very modest and humble but she also knew how to make a vehement rhetorical point when needed and wasn't hesitant to call out medical professionals on their assumptions and errors. She gave me lots of warmth and encouragement for my work on pregnancy in women of size, which was much appreciated as pregnancy is very much an overlooked area in HAES and size acceptance. As a parent, I particularly appreciated her advocacy for higher weight children in the midst of virulent anti-obesity public health campaigns. 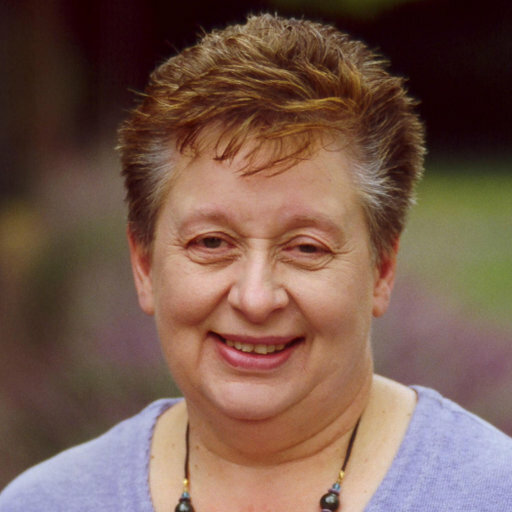 Joanne Ikeda was a god-send to the size acceptance community and people of size, and we will sorely miss her presence and influence. Our hearts go out to her family and friends. We have been discussing chiropractic care in pregnancy and how it can be helpful towards a more comfortable pregnancy and possibly a more efficient labor and birth. Many people are interested in seeing a chiropractor, but some know nothing about how to find a good chiropractor for pregnancy. Basically, all chiropractors receive some training in treating pregnant women, so you could see most chiropractors and get at least some help. However, some chiropractors are more highly trained in pregnancy than others and you are probably better off with those. The Webster technique is a specific chiropractic analysis and diversified adjustment. The goal of the adjustment is to reduce the effects of subluxation and/or SI [sacroiliac] joint dysfunction. In so doing neurobiomechanical function in the sacral/pelvic region is improved. The Webster Technique is not just for pregnant people, but can be applied to any weight-bearing person. However, its focus on relieving restrictions in the pelvis and restoring balance to the soft tissues in the area may be particularly very useful for pregnancy. Chiropractors who have extra training in working with pregnant people can be found in several ways. There are several chiropractic professional organizations, and they can be a good place to start your search. These organizations are similar in many ways, but may have differences of opinion on certain philosophies or treatments, etc. 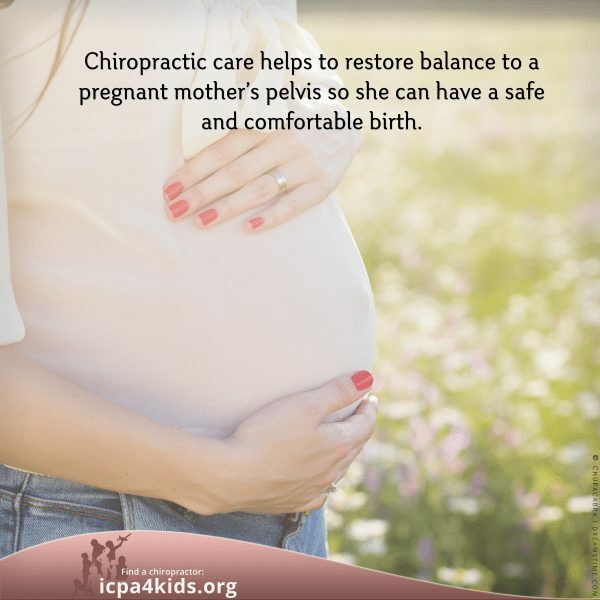 The International Chiropractic Pediatric Association (ICPA) has a list of chiropractors who specialize in working with kids and pregnant mothers, or who have completed a training course in Webster's Technique, which addresses the specific needs of the pregnant body. You can find a pediatric chiropractor with the ICPA at http://icpa4kids.org/Find-a-Chiropractor/. However, this is not a complete list of all the chiropractors who are certified in the Webster Technique. The chiropractors on this list are ones who have asked to be put on this referral list. There may well be other chiropractors in your area who have been trained in the Webster Technique but did not sign up for this list. You can call the ICPA and ask if there are others in your area trained in the Webster Technique. According to the ICPA website, the ICPA has created a tiered level of training. The first level is "Webster-Certified," which means extra class time beyond the chiropractic degree specializing in the Webster Technique for pregnancy. It is often the starting point for even more advanced training. The next level is Pediatric Certification, but there are several levels of this. Some program participants have the initials F.I.C.P.A after their names, and undergo 120 hours of continuing education. Other participants undergo an expanded program of 200 hours and have the initials, C.A.C.C.P., after their names. The highest level of training is the Pediatric Diplomate, which requires 400 hours of continuing education, and these chiropractors have the initials D.A.C.C.P. after their names. The International Chiropractic Association (ICA) has a Council on Pediatric Chiropractics. Their focus is on treating children, but their definition of "pediatrics" includes in-utero babies so they treat pregnant women as well. Many of these ICA members have gone on to become Board Certified in chiropractic pediatrics in a 3-year post-graduate course of over 360 hours. These chiropractors have "D.I.C.C.P." after their names as well as "D.C." Look here for lists of those with a DICCP diploma. The ICA also has a list of members who are trained chiropractors who are interested in and specialize in children, but who may or may not have the further training that a "DICCP" diplomate has. Some of the chiropractors on this list are in the process of working on the DICCP diplomate program but have not finished it yet. Regardless, they may be excellent possibilities as well. In addition, the ICA can be reached at 1 (800) 423-4690 to ask for referrals in person. Ask for a pediatric chiropractor who knows the Webster Technique. Not everyone who is certified in Webster's Technique is going to be on the ICA or ICPA lists, but they are good first places to start looking. If you can't find anyone in your area from these lists, it doesn't mean there is no one to help you. Keep looking; many women who initially think there is no one in their area who can help them do eventually find help. It just may not be from the above sources. One of the best ways to find a Webster-certified chiropractor is to try calling your local homebirth midwives, childbirth educators, and doulas and asking for a recommendation. Often they are familiar with the healthcare professionals in the area that offer pregnancy-related services and can recommend the best ones to you, saving you a lot of time and trouble. If you cannot find a chiropractor trained in the Webster Technique in your area, you could consider a chiropractor who has extensive experience with pregnant women. Even basic chiropractic care may help enough to make a difference in your comfort level. But if you have a choice, someone trained in the Webster technique is probably preferable. People in countries that don't have chiropractors may want to try an osteopath. Osteopaths also do body manipulation to help align the body and relieve restrictions, although not quite in the same way as chiropractors. However, not all osteopaths do manipulations anymore. You might need to find one who has had classical osteopath training. If they have not been trained in any of these techniques and/or are not experienced with pregnant women, do they know of any chiropractors in the area who are? Talk to them on the phone if you can and get an idea of how experienced they are and whether they "click" with you. If they sound good, consider trying them for one visit to see how things go. Some chiropractors will do a free consultation so you can visit their practice and check them out. Others might let you observe someone else's treatment (with the patient's permission) so you can see the techniques in action. Ask how many pregnant women the doctor usually sees. Ask for referrals from other patients. Call the midwives in your area and see if they have any experience with that chiropractor. Remember, all chiropractors are not alike. Some use pretzel adjustments by twisting and turning the patient's body. Some use a drop table to give a little bit of extra force to the adjustment without having to push on the patient as hard. Some use an activator, a spring-loaded small tool that exerts less force for those who dislike traditional adjustments. Some do hands-on work so subtle it's hard to know they are doing anything. There are many, many techniques and styles out there. Keep your "quackometer" on alert and don't be afraid to try a different chiropractor if one doesn't seem right to you, if the treatment seems unreasonable or ineffective to you, or if they seem too profit-driven. If one chiropractor doesn't work well for you, it doesn't mean that none will. Sometimes it's just a matter of finding the one that fits you and your needs. If in the end you decide that chiropractic care is not for you, that is a perfectly legitimate choice as well. Many women go through pregnancy without chiropractic care and do just fine. But if you have lots of back pain, pelvic pain, or a history of falls and/or accidents, it may be worth searching a little harder to find the right chiropractor for your needs. Although I didn't really experience much significant back problems before pregnancy, once I was pregnant I began to have tremendous back pain, sciatica, and pubic symphysis pain, probably from a series of minor car accidents years before. My care providers shrugged my pain off as a normal part of pregnancy, but by the end of my second pregnancy I could hardly walk at times. This certainly didn't seem normal to me, so I decided to consider a chiropractor. My search for a chiropractor was long and involved. At the time, there were no lists from the ICA or the ICPA to check, and the local chiros I consulted did not even know about the Webster Technique. I saw several different chiros or osteopaths (D.O.s) over the years, looking for some help. It took a long time to find the right one. The first chiro I tried was a sports specialist available through the local family doctor's office. Unfortunately, he was majorly fat-phobic and obviously disgusted by my body. He never physically evaluated my back or pelvis, and he never touched me. He told me that my back pain was because I wasn't getting enough exercise, and gave me some special exercises to do for the muscles in the area. I tried them; they didn't help. I gave up the idea of chiro care for several years. In my third pregnancy, I stepped up the effort to find some help. None of the doctors or midwives I saw knew of anyone who knew the Webster Technique. I saw an osteopath who had never heard of the Webster Technique, told me my back and pelvis were fine despite all my pain, and was basically no help. My prenatal yoga teacher in that pregnancy eventually mentioned a chiropractor who used a less forceful "Network" technique for adjustments and who specialized in sacrum pain. I decided that this was better than nothing and saw this chiro. These treatments did not really help much but he happened to know of a young chiropractor in the area who was in the process of getting her DICCP diplomate from the ICA, so he referred me to her. Amazingly, this chiro had just learned the Webster Technique at a recent class session and was able to help me out. She was shocked at how badly my back and pelvis were out of alignment. My back and pubic symphysis pain improved greatly within an hour or two after treatment. Although we weren't trying to turn the baby with the adjustment, the baby turned from posterior to anterior within an hour after the adjustment, the first time any of my babies had been anterior in three pregnancies. I went on to have a few more appointments in that pregnancy to keep things aligned and fine tune everything. Two weeks later, my baby was born by VBAC, Vaginal Birth After Cesarean. My third labor and birth was SO much easier than my first two. In my first pregnancy, I had pushed for 2 hours with a malpositioned baby, then had a cesarean. In my second pregnancy, I had pushed for 5 hours with a posterior baby, then had a cesarean. In this pregnancy, I pushed for 12 minutes and the baby was born. He was born so quickly the doctor didn't even make it to the birth; the nurse had to catch the baby. I attribute the relative ease of this birth to the chiropractic care and the fact that the baby had turned to anterior, unlike my previous babies. 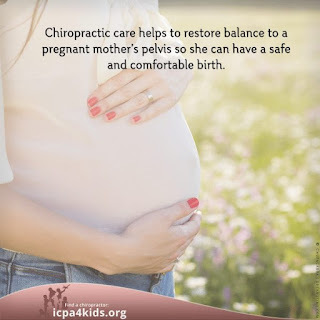 In my fourth pregnancy, I tried an ICPA-trained chiro who was located much closer to home because I was tired of the long drive to my usual chiropractor. The new chiro was perfectly nice and very competent, but she didn't "get" my body and was not able to give much relief. So even though this chiropractor knew the Webster Technique, was very well-trained and knowledgeable, and was certified through the ICPA, she wasn't the right chiropractor for me. At one point, I also tried a different osteopath, one with more "classical" manipulation training, and did not find those results as effective either. I eventually went back to a chiropractor trained by my original chiropractor, realizing that a long drive was well worth the trouble to get better results. He focused not only on my back/sacrum, but especially on my pubic symphysis and supporting ligaments because of my pain there, and we found that I tended to respond to that protocol best. I gave birth to my ten-pound baby (a pound bigger than my cesarean babies) with just 24 minutes of pushing. I'm sure it was not all due to just chiropractic care, but I do believe that a lot of it was. I was glad I had persevered in my chiropractic search. Finding a good chiropractor for pregnancy is not always easy. Just as not every OB or midwife is equally effective for everyone, it's important to find a chiropractor that "gets" your body, uses techniques that you find helpful, and is always respectful and responsive to your concerns. Don't just stop at the first chiro you find, try it once, and then conclude that chiropractic care is not for you. Try out several different styles if you can. If you can't do that, get the advice of local midwives and doulas because they often know the very best people in the area to recommend. Their guidance can save you a lot of time and effort. Remember, just as with an OB or midwife, it's all about finding a provider who is compatible with you. My own story shows the importance of searching for the practitioner who is right for you. The first chiros and osteopaths I tried were not able to help me. Had the ICA or ICPA lists been available then, my original pregnancy chiro would not have been listed because she was still in the process of training. An ICPA-trained chiro that I tried later looked great on paper but was not effective for me. 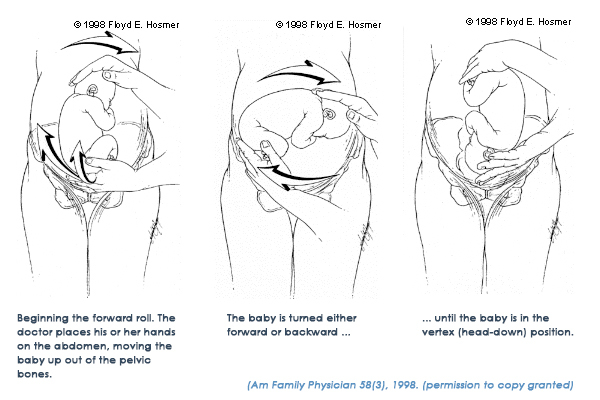 The chiros I saw saw for the fourth pregnancy were not listed because neither of them is a DICCP diplomate ─ but they were trained by a DICCP diplomate and so were familiar with the techniques needed. The chiropractor that was the closest and most convenient to me did not turn out to be the best chiropractor for my body. It took quite a bit of "shopping around" to find a chiro that worked well for my needs, but in the end it was well worth the work. There are no easy or quick answers to searching for a good chiropractor for pregnancy. If at first you don't find a Webster Technique chiropractor, keep trying. If the chiro you try at first doesn't seem able to help you or you don't get good results with them, be willing to try others. Good and bad chiros are all over; lists can be a good place to start your search but ultimately they don't tell you much about the quality of the chiropractors themselves. Nothing substitutes for actually trying something and keeping the search up till you find one that really clicks with your needs.